"How Burroughs Wrote The 'Tarzan' Tales"
The New York Herald on Page 4 of the "Christmas Books Number"
of their "Books And Magazine" section. It was subsequently reprinted in the book version of Tarzan And The Ant Men as a 4-page supplement in the back of the American first edition (A. C. McClurg and Company, 1924) and as the introduction to the British edition of the same book (Methuen and Co., Ltd., 1925). The Davis article was dropped from later reprints of Tarzan And The Ant Men. Whether the version of the article in those two books was revised or expanded from the newspaper version, I don't know since there seems to be no cover-to-cover scan of either the 1924 McClurg or 1925 Methuen edition (and the Davis article doesn't appear in any eBook edition of Tarzan And The Ant Men that I've checked). Your editor has typed out the text for easier reading and control. Should be more compatible for tiny screen viewers. By Robert H. Davis Edgar Rice Burroughs began in 1912 to write his amazing stories of the Ape-man, since translated into numerous tongues and sold throughout the world by the million copies. The ninth novel "Tarzan and the Golden Lion," is the leading novel in the fortieth anniversary number of the Argosy-All-Story Weekly. 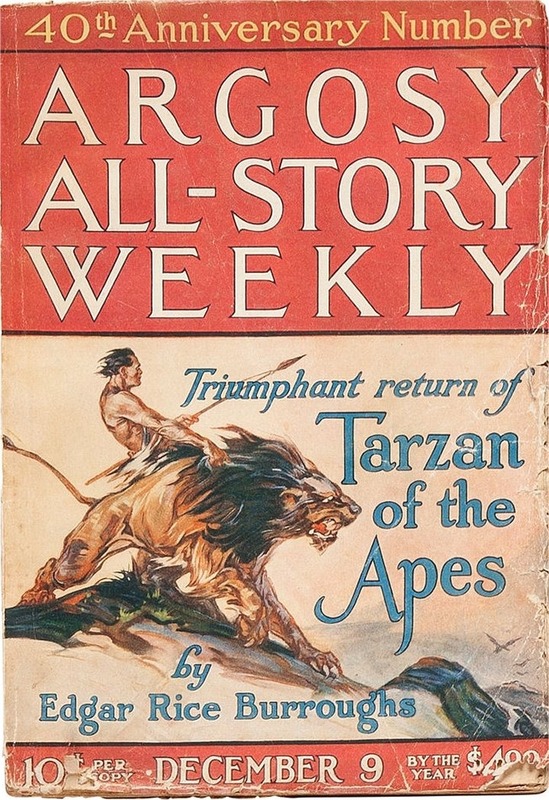 In all the history of popular American fiction nothing is more absorbing than a chronological record of the "Tarzan" tales, the first of which, "Tarzan of the Apes," appeared in the pages of the Argosy-All-Story in 1912. In spite of the fact that the serial made a tremendous impression, nearly every reputable book publisher in the United States rejected it, including McClurg, who afterward secured and published it in book form. Thirteen London publishers declined it with thanks until Methuen came to the rescue and carried the banner of "Tarzan" to every English speaking corner of the world. The summary of the adventures of Tarzan is interesting. In "Tarzan of the Apes," the first volume, an English couple, Lord and Lady Greystoke, were put ashore on the West coast of Africa by a mutinous crew. The man built a cabin where the couple were safe from the attacks of wild beasts; but one day he was set upon by a huge gorilla. Lady Greystoke came to his rescue, and though she shot the beast the shock of the encounter unbalanced her mind. That night a son was born to her, and a year later she died. Upon the same day her husband was killed by giant ape, one of which, a female called Kala, having just lost her own son, adopted the infant Greystoke. She called the man child Tarzan, which means white skin in the language of the great apes, and reared him to maturity -- a savage beast among savage beasts. The life of Tarzan of the Apes is symbolic of the evolution of man and the rise of civilization, during which mankind gained much in its never ending search for luxury; but not without the sacrifice of many desirable characteristics, as well as the greater part of its liberty. How Tarzan grew almost to manhood before he saw another human, how he fought the battles of the primitive jungle after the manner of the beasts of the jungle, how he rose to the kingship of them all, developing an amazing strength and a courage supreme above the very beast of the jungle itself -- upon these things are built the action of the story. And last came white men and a white girl, Jane Porter. Most of the former he looked upon as weaklings and held in contempt, but the latter he loved, and won -- and lost. Here ended the first book of Tarzan. 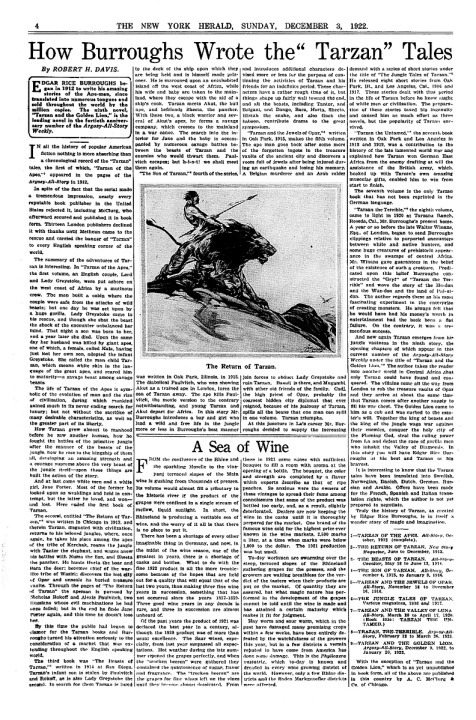 The second, entitled "The Return of Tarzan," was written in Chicago in 1912, and therein Tarzan, disgusted with civilization, returns to his beloved jungles, where, once again, he takes his place among the apes of the tribe of Kerchak, roams the jungle with Tantor the elephant and wages anew his battles with Numa the lion and Sheeta the panther. He hunts Horta the boar and Bara the deer, becomes chief of the war-like tribe of Waziri; discovers the lost city of Opar and unseals its buried treasure vaults. through the pages of "The Return of Tarzan" the apeman is pursued by Nicholas Rokoff and Alexis Paulvitch, two Russians whose evil machinations he had once foiled; but in the end he finds Jane Porter again, and this time he doesn't lose her. By this time the public had begun to clamor for the Tarzan books and Burroughs turned his attention seriously to the consideration of a market that was extending throughout the English speaking world. The third book was "The Beasts of Tarzan," written in 1914 at San Diego. Tarzan's infant son is stolen by Paulvitch and Rockoff, as is also Lady Greystoke the second. In search for them Tarzan is lured to the deck of the ship upon which they are being held and is himself made prisoner. He is marooned upon an uninhabited island off the west coast of Africa, while his wife and baby are taken to the mainland, where they escape with the aid of a ship's cook. Tarzan meets Akut, the bull ape, and befriends Sheeta, the panther. With these two, a black warrior and several of Akut's apes, he forms a savage company, which crosses to the mainland in a war canoe. The search into the interior for Jane and the baby is accompanied by numerous savage battles between the beasts of Tarzan and the enemies who would thwart them. Paulvitch escapes; but h-i-s-t! we shall meet them again. "The Son of Tarzan," fourth of the series, was written in Oak Park, Illinois, in 1915. The diabolical Paulvitch, who was showing Akut as a trained ape in London, lures the son of Tarzan away. The ape kills Paulvitch, the movie version to the contrary notwithstanding, and young Tarzan and Akut depart for Africa. In the story Mr. Burroughs introduces a boy and girl who lead a wild and free life in the jungle more or less in Burroughs's best manner and introduces additional characters devised more or less for the purpose of continuing the activities of Tarzan and his friends for an indefinite period. These characters have a rather rough time of it, but things shape up fairly well toward the end, and all the beasts, including Tantor, and Bolgani, and Dango, Bara, Horta, Sheeta, Hista the snake, and also Goob the baboon, contribute drama to the great symposium. "Tarzan and the Jewels of Opar," written in Oak Park, 1915, makes the fifth volume. The Apeman goes back after some more of the forgotten ingots in the treasure vaults of the ancient city and discovers a room full of jewels after being injured during an earthquake and losing his memory. A Belgian murderer and an Arab raider join forces to abduct Lady Greystoke and ruin Tarzan. Basuli is there, and Mugambi,, with other old friends of the family. Cadj, the high priest of Opar, probably the coarsest hidden city diplomat that ever reigned because of his jealousy of Tarzan, spills all the beans that one man can spill in one volume. Tarzan triumphs. At this juncture in La's career Mr. Burroughs decided to supply the increasing demand with a series of short stories under the title of "The Jungle Tales of Tarzan." He released eight short stories from Oak Park, Ill., and Los Angeles, Cal., 1916 and 1917. These stories dealt with that period in the life of Tarzan before he knew aught of white men or civilization. The preparation of these stories taxed his ingenuity and caused him as much effort as three novels, but the popularity of Tarzan survived. "Tarzan the Untamed," the seventh book written in Oak Park and Los Angeles in 1918 and 1919, was a contribution to the history of the late lamented world war and explained how Tarzan won German East Africa from the enemy drafting at will the assistance of f the British army, which, hooked up with Tarzan's own amazing muscular gifts, enabled him to win from start to finish. The seventh volume is the only Tarzan book that has not been reprinted in the German language. "Tarzan the Terrible," the eighth volume, came to light in 1920 at Tarzana Ranch, Reseda, Cal., Mr. Burroughs's present home. A year or so before the late Walter Winans, Esq. of London, began to send Burroughs clippings relative to purported encounters between white and native hunters, and some huge creatures of prehistoric appearances in the swamps of central Africa. Mr. Winans gave guarantees in the belief of the existence of such a creature. Predicated upon this belief Burroughs constructed the "Gryf" of "Tarzan the Terrible" and wove the story of the Ho-don and the Waz-don and the land of Pal-ul-don. The author regards these as his most fascinating experiment in the enterprise of creating monsters. He always felt that he would have had his money's worth in entertainment had the book been a flat failure. On the contrary, it was a tremendous success. 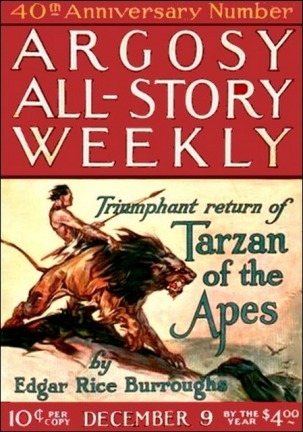 And now again Tarzan emerges from his jungle vastness in the ninth story, the opening chapters of which appear in this current number of the Argosy-All-Story Weekly under the title of "Tarzan and the Gold Lion." The author takes the reader into another world in Central Africa that only Tarzan could have found an conquered. The villains come all the way from London to rob the treasure vaults of Opar and they arrive at about the same time that Tarzan comes after another supply to fill his war chest. The Golden Lion came to him as a cub and was curbed to the master's will. Together the king of beasts and the king of the jungle wage war against their enemies, conquer the holy city of the Flaming God, steal the ruling power from La and defeat the race of gorilla men who inhabit the Valley of Diamonds. 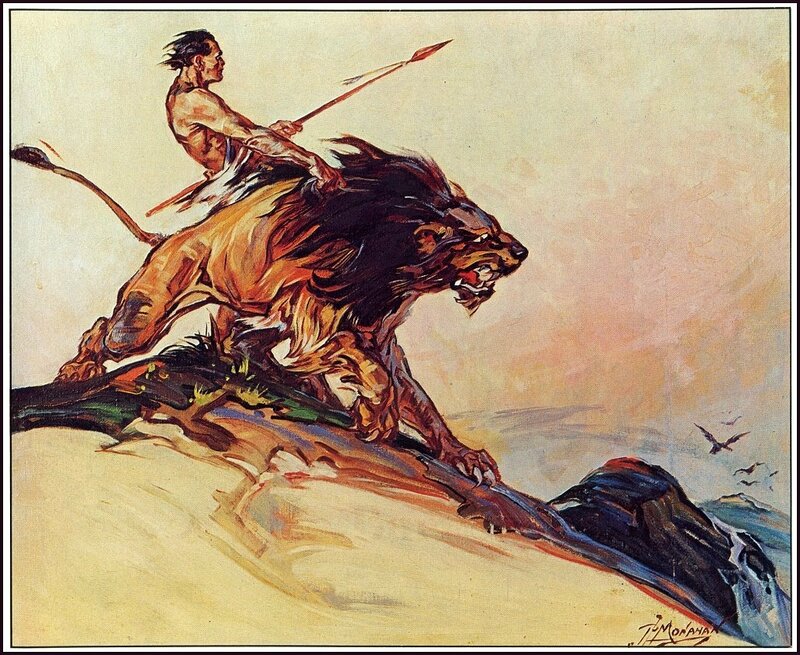 In this story you will have Edgar Rice Burroughs at his best and Tarzan at his bravest. It is interesting to know that the Tarzan tales have been translated into Swedish, Norwegian, Danish, Dutch, German, Russian and Arabic. Offers have been made for the French, Spanish and Italian translation rights, which the author is not yet prepared to negotiate. Truly the history of Tarzan, as created by Edgar Rice Burroughs, is in itself a wonder story of magic and imagination. 2--THE RETURN OF TARZAN. New Story Magazine, June to December, 1912. 3--THE BEASTS OF TARZAN. All-Story-Cavalier, May 16 to June 13, 1914. 4--THE SON OF TARZAN. All-Story, December 4, 1915 to January 8, 1916. 5--TARZAN AND THE JEWELS OF OPAR. All-Story, November 18 to December 16 1916. 6--THE JUNGLE TALES OF TARZAN. Various magazines, 1916 and 1917. 8--TARZAN, THE TERRIBLE. Argosy-All-Story, February 12 to March 26, 1921. 9--TARZAN AND THE GOLDEN LION. Argosy-All-Story. December 9, 1922 to January 20, 1923. With the exception of "Tarzan and the Golden Lion," which is yet unpublished in book for, all of the above are published in this country by A. C. McClurg & Co. of Chicago. "How I Wrote the Tarzan Books"